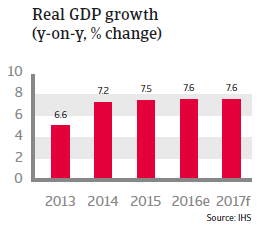 India’s economic growth outlook for 2017 remains robust, but a rather weak banking sector and high foreign indebtedness of domestic firms remain concerns. In the 2014 general elections the BJP gained a landslide victory by winning an absolute majority in parliament (282 of the 543 seats in the Lower House); the first time since 1984 that any party has won a majority. The Modi legislature has brought forward ambitious initiatives to promote urbanisation and improve connectivity and infrastructure, as well as finally unifying VAT across the country (a national goods-and-services tax would boost GDP substantially by removing barriers to trade between India’s many states and create a single market). 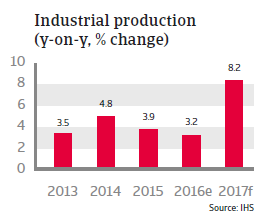 Initiatives to improve foreign direct investment liberalisation, a modest reduction of the bureaucratic burden, merchandise output-enhancing initiatives and the activation of new power plants are likely to increase business confidence and stimulate investors’ appetite further. However, the government still lacks a majority in the Upper House, where the opposition retains a strong position. As most of the major reform bills require approval from both chambers, reform progress in sensitive areas has been limited so far. 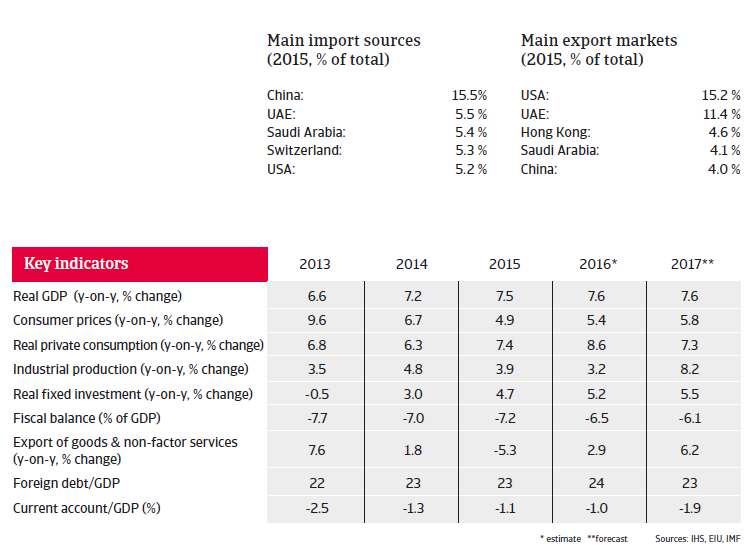 India´s 2017 economic outlook remains the most promising in Asia, with GDP forecast to increase around 7.5%. The economy benefits from a stable political climate, a reform-oriented government and low oil prices (India is a large net oil importer). Private consumption and government spending are the main drivers of economic growth. 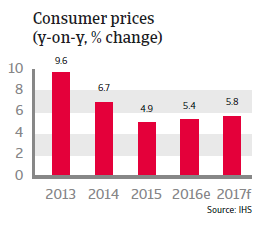 Lower inflation due to a tighter monetary policy has helped to increase consumer confidence, while the government is investing in power infrastructure, one of the largest obstacles to India´s long-term economic growth potential. 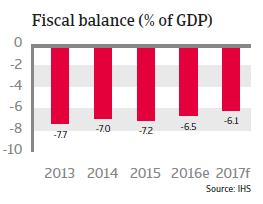 After the budget deficit declined in 2016 and is expected to continue declining in 2017, the government´s budget discipline is not very strong. 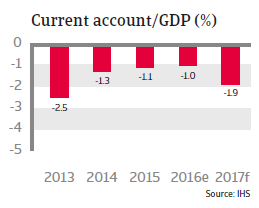 The deficit is expected not to decline much further in the coming years because of extensive government spending aimed at supporting state-owned enterprises, subsidy programmes, and infrastructure improvements, while revenues will stay subdued, despite the recent passing of a comprehensive reform of the Goods and Services (GST) tax system bill. However, the public deficit can be widely financed by domestic borrowing and its maturity is long, which mitigates the negative effects. India´s external position is comfortable and the country and sovereign risks remain low. Foreign debt amounted to only 24% of GDP in 2016. The liquidity situation is comfortable with more than eight months of import cover, while the current account deficit is expected to remain modest in 2017, on the back of still low oil and commodity prices. India has an excellent payment record, with no missed payments since 1970, providing it good access to capital markets. This generates substantial short-term capital and portfolio inflows; enough to cover the current account deficit and to maintain external debt levels low, rendering debt resilient to exogenous shocks. While India’s economy is expected to maintain its high growth rates in the coming years, private sector investments have decreased in the past few years due to low credit growth from the banking sector and high foreign indebtedness of domestic firms. This adversely affects India´s long-term growth potential. The Indian banking sector has improved its credit management, but many banks still show low capitalisation (capital adequacy ratio of 12.8% in 2015) and rising non-performing loans (4.6% of total loans in 2015). Several banks are exposed to large non-performing loans granted to big domestic companies. To a far greater extent than in other emerging economies, expected losses from non-performing loans and current debt-at-risk is overwhelming bank loan loss reserves in India. The central bank tries to mitigate the risks for the banking sector by stimulating them to write off non-performing loans, but this process is still in progress. Meanwhile, the government is too hesitant in recapitalising state-owned banks. Muted credit growth has pushed Indian businesses to request loans from foreign banks and in foreign currency because of lower interest rates, exposing some Indian businesses with large external debt levels. 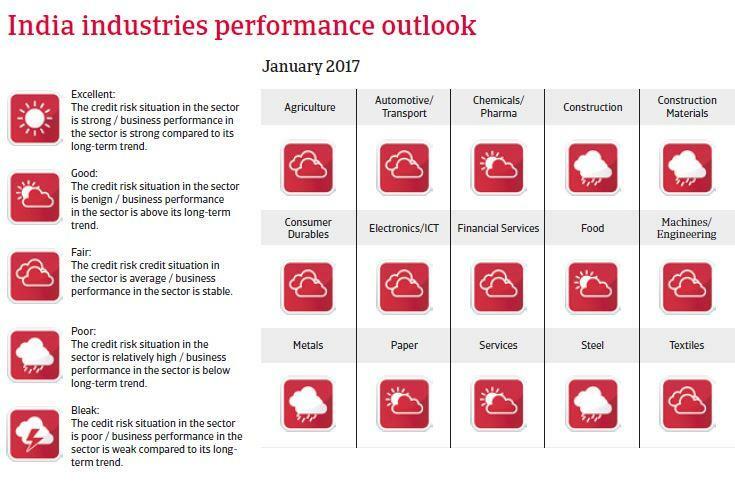 The situation seems to be stable for now, but in an adverse scenario - with changes in capital flows, rising global interest rates and/or strong depreciation of the rupee - businesses with high external debt and the Indian banking sector could face major problems. In May 2016 a new bankruptcy law was passed, designed to make it easier to wind down failing businesses and recover debts. In the longer term, this should give banks a clearer path to wrest control of insolvent companies unable to repay their debts and allow them to recover what is owed to them in a timely manner. However, in the short term there is still the challenge of creating a large pool of insolvency professionals who will help with the fast implementation of the law. The new regulators will also need to draft procedural rules for insolvency professionals and information utilities, among others. India has many structural deficiencies: an underdeveloped agricultural sector, poor infrastructure, inflexible labour laws, excessive bureaucracy, rigid land laws, and a shortage of skilled labour due to the poor education of most of the population. All of these factors are barriers to foreign investment and higher growth. Power supply, roads, railways, and the poor education system need to be urgently addressed, with more public/private investment partnerships needed for infrastructure projects. So far, private sector participation has focused mainly on the telecom sector, with investment in sanitation, power generation, roads and railways much lower than expected. Consequently, there is a continuing problem of power and water shortages in all of India’s major cities.